Registration for the MediaEval 2014 Multimedia Benchmark has opened. Please register using the MediaEval 2014 registration site (now open). We ask you to register by 1 May, when the first task will release its data set. After that point, late registration will be possible, but we encourage teams to register as early as they can. Descriptions of the tasks offered in 2014 can be found on the MediaEval 2014 page. Check these descriptions for more details on the tasks, target group, data sets and evaluation metrics. Also, the timelines for the task, which are set by the task organizers, are listed in these descriptions. Note that the timelines can vary from task to task. 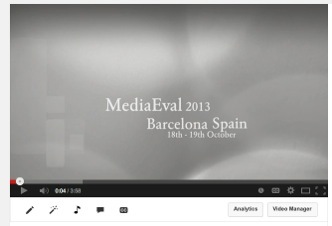 We are happy to announce the release of the MediaEval 2013 Workshop video. We are very pleased to announce the decision about the tasks that will be offered by MediaEval 2014 has been made and a list of the tasks have been posted to the MediaEval 2014 page. More detailed task descriptions will follow shortly. Signup to participate in the tasks will open within the next two weeks. Please watch this page for more information.